Registration for 2019 Summer camps will open May 11th @10:00am on this page. 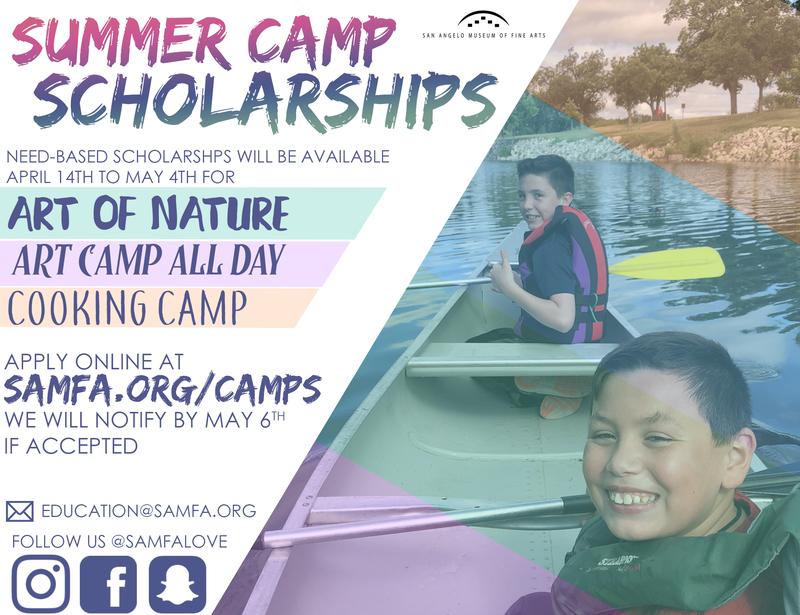 Scholarships for Camp are open! 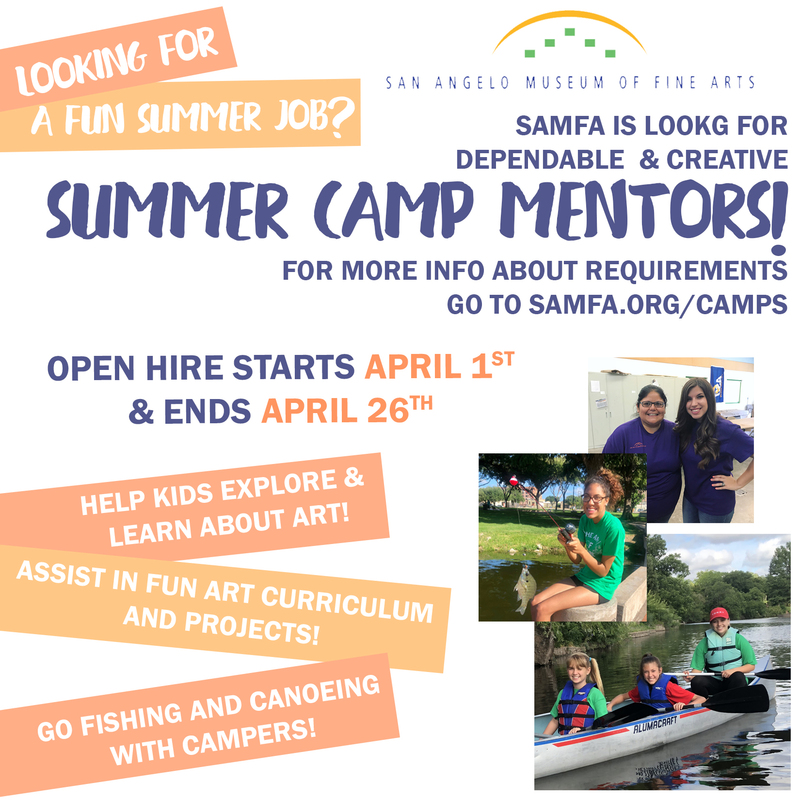 Want a job as a Summer Camp Mentor? please specify if you are interested in specific camps and hours. all applications welcome! Follow us on Instagram @samfacamps to see pictures and videos from all of our camps! 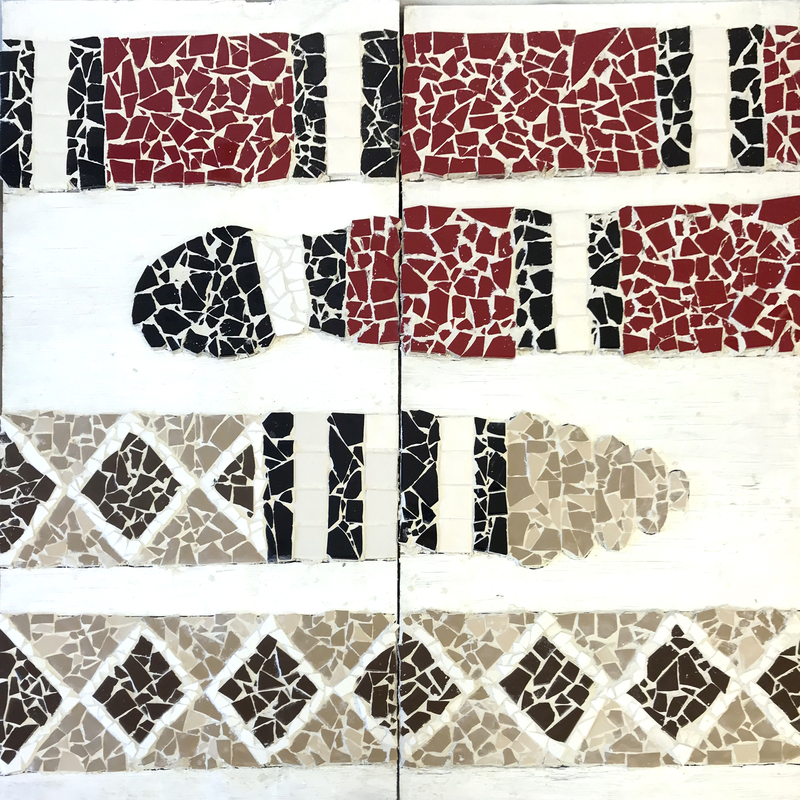 For Art Camp All Day in 2018, We decided that one of our big group projects would be to paint and assemble Murals to go in Paint brush Alley: a popular art spot in San Angelo for displaying Public Art. 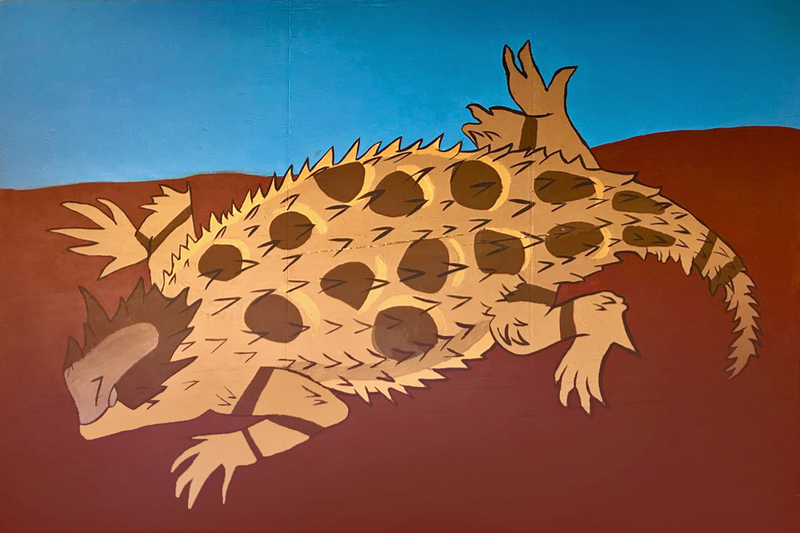 Both the 7 - 9 year old and 10 - 12 year old groups had a chance to create 2 murals that reflect SAMFA, young artists in San Angelo, and the spirit of Texas. You can find a timelapse of the background being painted here. The flowers included: Sunflowers, Bluebonnets, Blackfoot Daisy, Texas Thistle, Indian Paintbrush, and Mexican Hat. The Murals were designed as a "Paint-by-number" on a wooden panel. 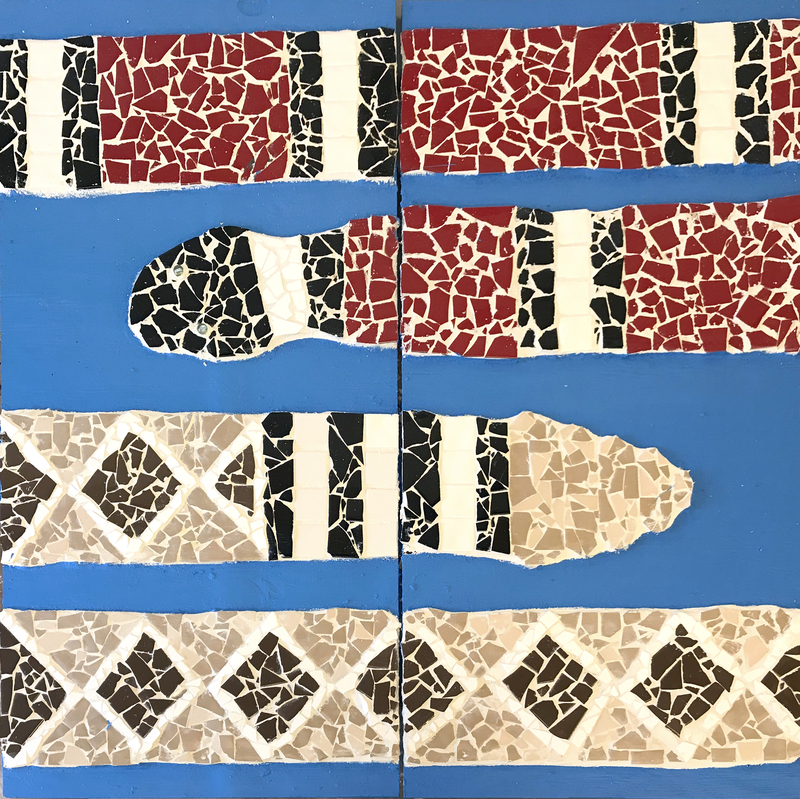 The two snakes on our mosaic are the Rattlesnake and the Texas Milk Snake. If you were unable to register for camp, we still offer free programming every Thursday at Art Thursday and every 2nd Saturday of each month at Family Day! We believe that a parent’s presence can be distracting to some children as well as staff. Therefore, we prefer parents do not stay. This is standard practice by other museums and comparable institutions. However, if there is a specific need to stay and observe your child; this will need prior approval from the Curator of Education. The specific times must be approved by the Curator of Education and the Lead Mentor at least two weeks prior to camp start date. You must contact the Curator of Education privately to setup volunteer times. - Campers grow personally. They are given the chance to experience new things and interact with other children on a daily basis. - Campers learn new things. Whether it’s playing a new game, practicing an existing skill or developing their social skills, campers leave our camp having learned something they can remember for a lifetime. 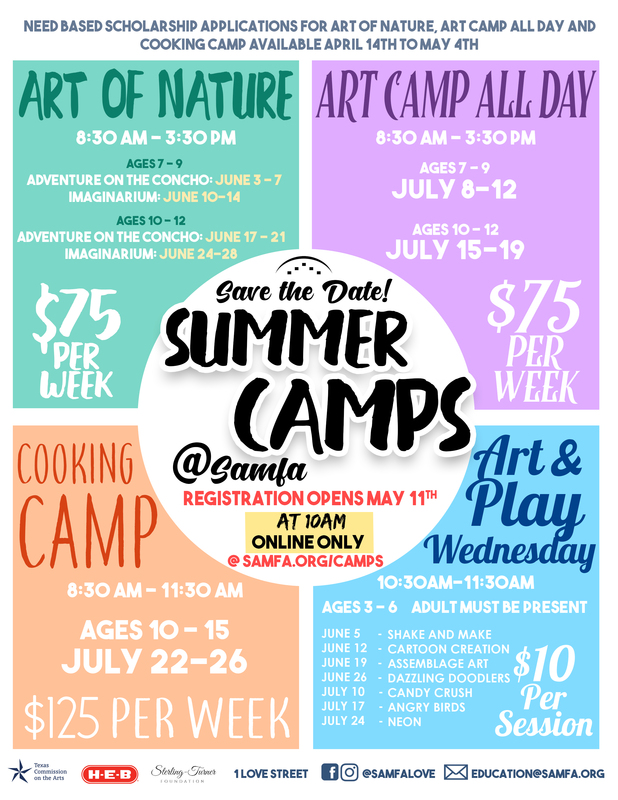 Any questions concerning summer camp information can be emailed to studio@samfa.org. The summer of 2015 brought technology and water together @ SAMFA. Art Camp All Day: Art Engineers; helped children 7-12 years old create and edit film using open Source Media. These short films were entered into the 2015 Water Texas Film Contest in Austin that aims to find ways to raise awareness regarding the true value of our water sources. All videos entered in the contest were both filmed and edited by 7-12 year old campers at Art Camp All Day, with the assistance of camp instructors Brian Beck, Blanca Hernandez, and Jenny Combest. Special Thanks to Brian Beck, creative Director of Open Source Initiatives and Co-founder of TexOS. Explore the natural, artistic and scientific wonders in San Angelo. Then create artworks inspired by nature. 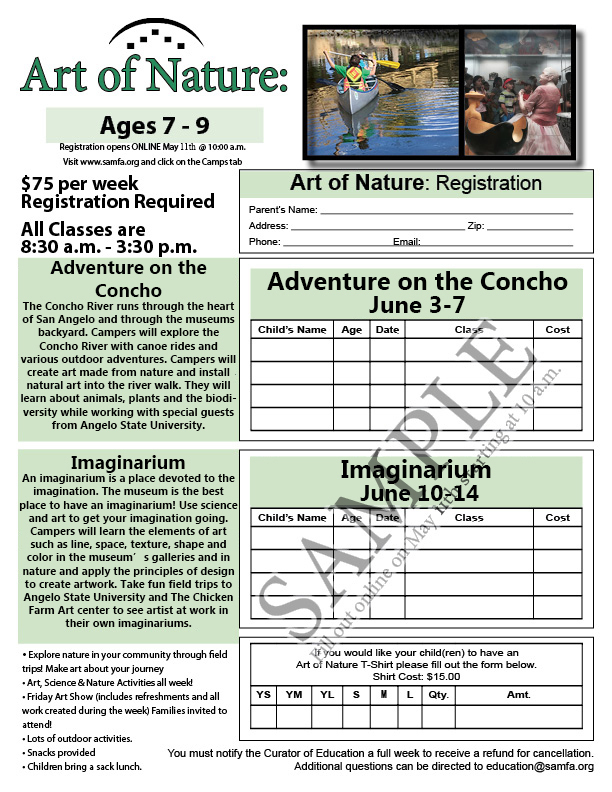 Classes are from 8:30 a.m. to 3:30 p.m. For ages 7 through 12. Creating something healthy and delicious to eat is an art form! 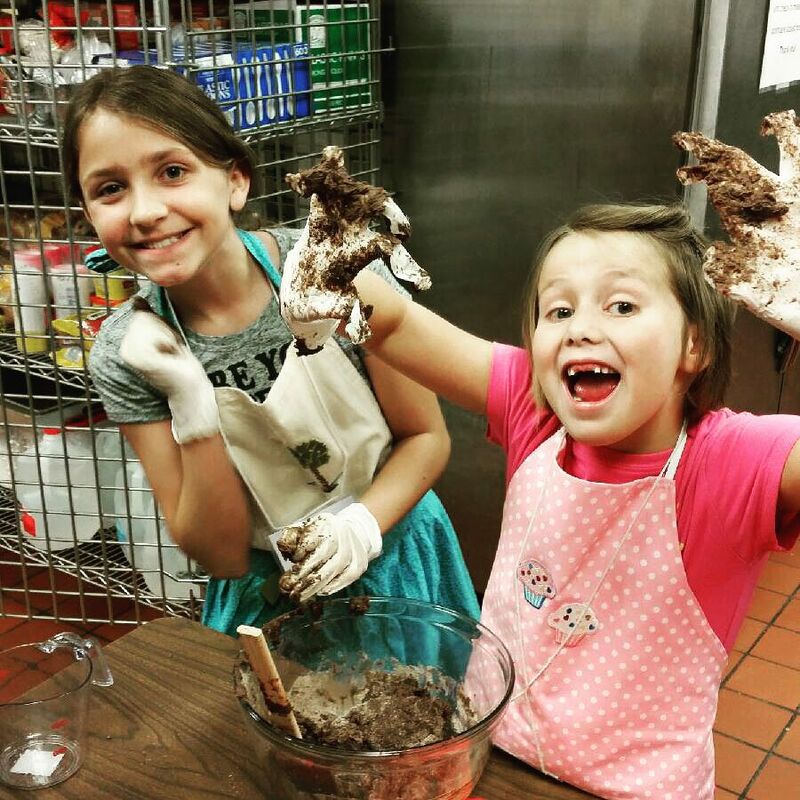 Register for half day classes taught by local baker, Brenda Wellen. Classes are from 8:30 a.m. to 12:30 p.m. For ages 10 through 15. Join us every Wednesday for a creative play date! Stories, hands-on activities, and art projects. Classes are from 10:30 a.m. to 11:30 a.m. Preregistration is required. For ages 3 to 6 (Adult Companions required).